The 3C of Cornellà receives on Thursday May 24 a technical visit of several representatives of the Network of Cities and Towns in favor of Sustainability. It is an activity that adds to the set of actions with which the different 3C of our social agriculture program are open to society to interact with the agents of their environment, share knowledge and experiences and enrich their work and their own training of activists and their impact at the local level. The Network of Cities and Towns in favor of Sustainability is an association that brings together 290 municipalities in Catalonia committed to the environment to move towards sustainable development. Under the umbrella of the Diputació de Barcelona, ? ?this entity has a Municipal and Social Gardens Commission that carries out various activities throughout the year. 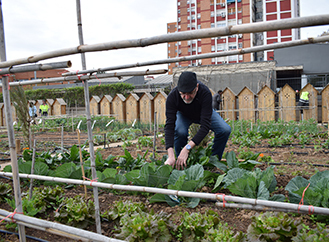 In this case, its members will know the experience of two spaces of Cornellà: 3C, also known as Community Gardens of Sant Ildefons by the name of the neighborhood in which it is located, and the Gardens of Can Mercader. The appointment will take place on May 24 in the morning on two stages, the auditorium of the Library of Sant Ildefons and in both gardens. The day will start with a double presentation: first of the projects of social, municipal and school gardens of Cornellà de Llobregat and then of the Bio Week of ecological agriculture 2018. Later it will be the turn to visit the two natural spaces. The first will be 3C, with our agricultural technician Ángel Cabezas at the helm, who will explain the origin and development of the program and the orchard, and then expand on technical concepts on sustainable practices that activists carry out. The orchard was launched in 2015 thanks to the agreement between the City of Cornellà and Humana. The Consistory ceded the land of 2,105 m2 while the Foundation assumed its management and the incorporation of an agricultural technician who trains the activists: 41 in the first promotion and 27 at the moment in the second. The day is directed to municipal technicians of environment and social services, managers of projects of social gardens and users of municipal and social orchards. 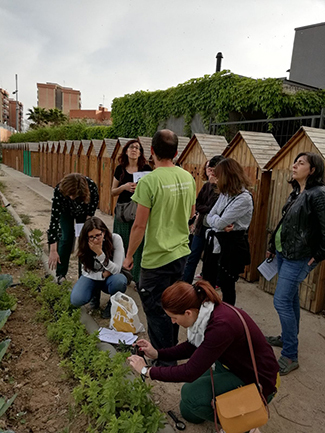 In this sense, several local teachers of the Network of Schools for the Sustainability of Catalonia (XESC, in its acronym in Catalan) recently visited the Cornellà garden in the framework of an activity on biodiversity. Last February, the Foundation coordinated a workshop with five local professors from XESC and two technicians from Cornellà City Council. The activity, which took place at the Pedagogical Resource Center (CRP) of Baix Llobregat, consisted of a theoretical session on biodiversity and a practice to develop insect hotels. "We tried to explain various concepts related to biodiversity applied to gardens," says Cabezas, "so that teachers could learn them and then pass them on to their students. It was a very successful activity because they were very willing to learn. " On that occasion they developed five structures or hotels for insects. Recently, Humana's own agricultural technician gave a demonstration talk in the garden about biodiversity and ecological agriculture.